Glandular odontogenic cyst (GOC) was first documented as “sialo-odontogenic cyst” by Padayachee and Van Wyk in 1987. They published two cases that bear a resemblance to both the botryoid odontogenic cyst (BOC) and the central mucoepidermoid tumor of jaws. After careful analysis, they concluded both lesions as separate entities. GOC is very rare, and only 111 cases have been documented in the English literature so far. In general, this cyst is encountered in the anterior areas of the mandible, is more common with a wide age range, the mean age being 49.5 years, and has a tendency to recur. Radiographically, it is radiolucent, well-defied, either unilocular (53.8%), or multilocular (46.2%) with frequent perforation (61%) and thinning of cortical plates (24.4%). Furthermore, English literature revealed recurrence rate that varies from 21%–55%, which indicates its aggressiveness. Therefore, a confirmatory diagnosis is critical for treatment and follow-up. A 43-year-old female patient reported with chief complaint of painful swelling in upper right front tooth region since 7–8 months. Extraorally, the swelling was not obvious and did not produce any facial asymmetry. Intraoral examination revealed a single palatal swelling in the right maxillary region extending from 11 to 13 (FDI tooth numbering system) approximately 3 × 1 cm in size. The overlying mucosa was of normal color and appearance [Figure 1]a. On palpation, the swelling was firm, non-tender, non-mobile, and non-pulsatile. A provisional diagnosis of ameloblastoma and differential diagnosis of odontogenic keratocyst was given. The radiographic examination revealed a unilocular radiolucent area with well-defined sclerotic border extending from 11 to 13 regions along with root divergence [Figure 1]b. An incisional biopsy was done, and the specimen was sent for histopathological examination. The macroscopic examination revealed single tissue bit of 0.8 × 0.4 cm in size, creamish white in color, and firm in consistency. The Hematoxylin and Eosin stained tissue section revealed thin non-keratinized stratified squamous epithelium showing focal thickened plaques projecting into lumen. The epithelium also shows mucous cells and some ciliated cells [Figure 1]c and [Figure 1]d. The underlying connective tissue stroma was fibrocellular with infiltration of chronic inflammatory cells chiefly lymphocytes and plasma cells. Blood vessels of varying size and shape were also evident. The histopathological features confirmed the diagnosis of GOC. GOCs are rare intrabony solitary or multiloculated cysts of odontogenic origin. GOCs are now relatively well-known entities; their importance relates to the fact that they exhibit a propensity for recurrence rates from 21% to 55%, similar to odontogenic keratocysts and may be confused microscopically with central mucoepidermoid carcinoma (CMEC). The GOC is included in the WHO histologic typing of odontogenic tumors under the terms GOC or sialo-odontogenic cyst. To the best of our knowledge, only 111 cases of GOC has been reported in the literature, and Magnusson et al. observed that only 0.012% of the cysts seen on the oral cavity have fulfilled the criteria of GOC microscopically. There is a slight male predilection, and lesions occur mostly in middle-aged patients. The main clinical finding in this cyst is a painless local swelling; the clinical picture, however, is non-specific. Histopathologically, GOC should be differentiated from lateral periodontal cyst (LPC) and CMEC as they exhibit considerable overlap of histological features. The lining of LPC exhibits focal thickenings and glycogen-rich epithelial cells, similar to those observed in GOC. However, the identification of ciliated epithelium and duct-like spaces with mucous cells specifically differentiate GOC from LPC and BOC and favors the diagnosis of GOC. Treatment by enucleation or curettage alone is associated with a high recurrence rate. The surgical treatment of large lesions should include enucleation with peripheral ostectomy for unilocular cases and marginal resection or partial jaw resection in multilocular cases. Follow-up should be continued for at least 3 years. The purpose of this case is to increase the existing knowledge of this rare entity as histopathological diagnosis, and differential diagnosis of GOC is challenging for a pathologist. Azmi KE, Patel S, Pathak J, Swain N. Glandular odontogeniccyst mimicker: A novel entity. J Contemp Dent 2016;6:145-8. Shah M, Kale H, Ranginwala A, Patel G. Glandular odontogenic cyst: A rare entity. J Oral Maxillofac Pathol 2014;18:89-92. Kaplan I, Anavi Y, Hirshberg A. Glandular odontogenic cyst: A challenge in diagnosis and treatment. Oral Dis 2008;14:575-81. Rajendran R, Sivapathasundharam B. Shafer's Textbook of Oral Pathology. 5th ed. Elsevier; 2006:77-9. Tambawala SS, Karjodkar FR, Yadav A, Sansare K, Sontakke S. Glandular odontogenic cyst: A case report. Imaging Sci Dent 2014;44:75-9. Kramer IRH, Pindborg JJ, Shear M. Histological Typing of Odontogenic Tumors. 2nd ed. Berlin: Springer; 1992. Krishnamurthy A, Sherlin HR, Ramalingam K, Natesan A, Premkumar P, Ramani P, et al. 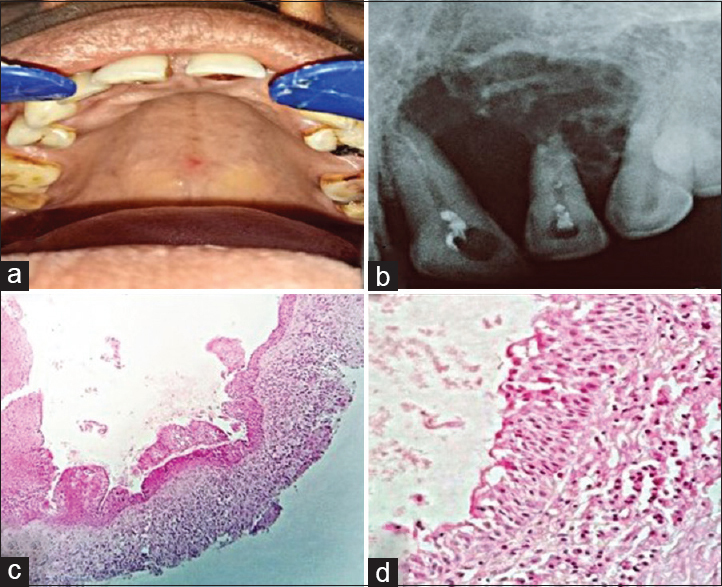 Glandular odontogeniccyst: Report of two cases and reviewof literature. Head Neck Pathol 2009;3:153-8. Prabhu S, Rekha K, Kumar GS. Glandular odontogenic cystmimicking central mucoepidermoid carcinoma. J Oral Maxillofac Pathol 2010;14:12-5.